Hi my name is Bridget Murphy, I'm a retired school teacher from Happy Valley-Goose Bay, Newfoundland - Canada. Through penny drives, local fundraising, cookbook sales and your generous donations we have raised over $20,000 to build education infrastructure in Centro Chactela, Guatemala - one of the poorest regions in Central America. Learn more about the project in this interview or by browsing the site. Your donations have helped build one school in the region and we're now raising funds for a second. If you would like to donate use the donation box below - 100% of the donations go directly to the project. Since 2006, I have made three trips to visit and volunteer with Parroquia Cristo Redentor Mission in Playa Grande, Guatemala. This Mission is run by the Oblate Missionaries of Mary Immaculate and serves 120 villages. Many of these villages are accessible only by walking up mountains which can take up to as long as 2 hours. This mission serves one of the poorest regions in Guatemala and in fact, it is one of the poorest regions in Central America. This area of Guatemala is known for the massacres of entire villages which include women and children during the civil war of the 80s.This region is mainly inhabited by indigenous people, the Maya Q’eqchi, who receives little or no financial support from the government. During my stay, I was very fortunate to be able to visit many of these villages and to experience firsthand the level of poverty in the area. Many of the people live in poverty with little access to adequate jobs, medical care, good drinking water, electricity, housing and education. Many of these villages have no high school and the schools that are found in this area of Guatemala have few or no educational resources. They are also poorly staffed. The schools are substandard to say the least, with no electricity, no running water and no proper bathroom facilities other than an outhouse. The children have no access to a library, a computer room, or to a gym. In addition, education is only guaranteed to grade six. There is no educational funding available for youth after this grade. These youth have no means of fund raising as we do in our country. Many of these youth must try to find work, for very little pay, to help support their parents and siblings. The families have great difficulty in providing the basic needs of daily living. In January 2008, I made a visit to an area in Guatemala called Centro Chactelá. During that visit a group of teachers met with Fr. José Manuel Santiago, OMI, looking for his support to help secure funding to build a high school. Observing the poor conditions of primary schools and the need for a high school, I decided to take action and to help the teachers achieve this need. As a result Guatemala -Children First Project was born.The goal of this project would be a fundraising effort to raise the funds that would supply the much needed high school with textbooks, basic school supplies and desks. Some of my efforts to date have included: penny drives, yard sales, cookbook sales and soliciting donations. You cannot imagine my disappointment when I received word that the youth of this region would not be getting a high school any time soon. Their proposal had been denied. Not to be deterred by this news, I decided to start the second phase of “Guatemala- Children First Project” titled, “Building Dreams.” My project would not only provide school supplies but hopefully, will provide, the materials required to build the much needed high school and four latrines. 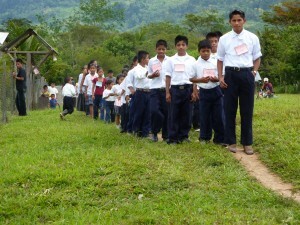 I am very pleased to report that “Guatemala – Children First Project” has raised $60,000 to date and two junior high schools have been built, one in 2010 and the other in 2012 plus 10 computers were provided in 2013. I am so overwhelmed by the spirit of generosity and goodwill that flourishes within the community of Happy Valley- Goose Bay and indeed within my province of Newfoundland and Labrador. Together, We Can Build Dreams!